And check out OUR NEWLY LISTED ITEMS. 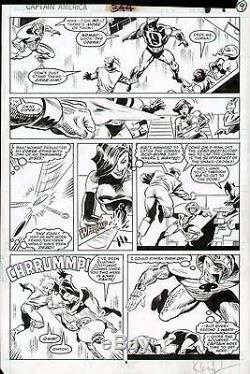 This is an original art page for Captain America #344, published by Marvel Comics in 1988. This is Pg 9 from the issue, and is a fantastic example, with awesome images of Nomad, D-Man, Viper, and Cobra from the Serpent Society! The top has been clipped during production, and there are tape pieces in the margins, but not on the actual artwork. The page is signed at the bottom right corner. This is a great piece of Cap artwork from a classic issue by the late great Mark Gruenwald, along with legendary artists Kieron Dwyer and Al Milgrom, that would look fantastic framed and prominently displayed, and would be an outstanding addition to any collection. Check out our other auctions for more great items. Check it out, you'll be glad you did! The item "CAPTAIN AMERICA #344 ORIGINAL COMIC ART PAGE DWYER NOMAD, D-MAN, VIPER, COBRA" is in sale since Friday, July 08, 2016. This item is in the category "Collectibles\Comics\Original Comic Art\Interior Pages". The seller is "satchj3" and is located in Brooklyn, New York. This item can be shipped worldwide.